Premium all-elastic construction with compression straps. Four 9" posterior plastic stays for stability and support. 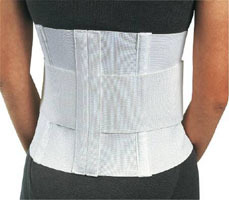 Ideal for providing support and com-pression for strains, sprains of the low back and abdominal area. Measurement Information: Measurements taken frmo Male Waist or Female Hip. Width 10 Inch This Product(s) is NOT returnable due to Healthcare department regulations. Please view our POLICIES page for more information.